"Warm, delectable, and aromatic - apple pockets are the perfect treat on a cold fall or winter day." In a bowl, toss apple slices together with sugar, flour, salt, apple pie spice, and vanilla extract until evenly coated. Lay pie dough flat on a lightly greased baking sheet. Pile apples on one side of dough, leaving a 1 inch border. Brush border and opposite half side of dough with milk. Fold dough over apples, being careful not to over-stuff or the dough will tear. Fold over edges and pinch together to seal. Cut several small slits in the top of the pocket with a sharp knife, then brush top with beaten egg. Bake in the preheated oven for 40 minutes, or until flakey and golden brown. Serve warm, or at room temperature. 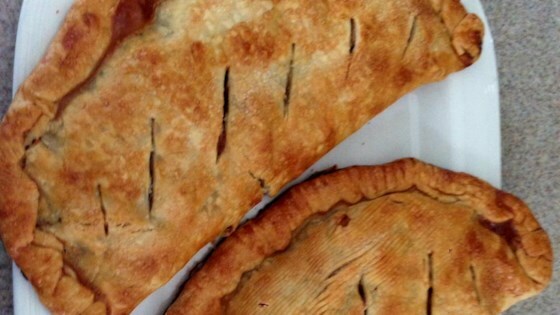 Learn how to make Grandma Ople's famous apple pie. I made this with pilsbury prerolled pie crust, used 5 apples instead of 3, turned out amazing!! My boyfried and I ate both of them before they were able to cool!! I did not like it ,the dough was hard to work with and it need some more of some.I would not make it again.